It may feel like I was in Florida for weeks, but I was really only there for three days. 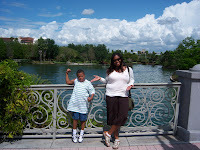 We spent day two hanging out at Universal Studios. The best part about me having an eight year old brother is that we watch the same shows. It means we watched more Ben 10 in the hotel room than Law & Order. My dad loves Law & Order. If there's an all day marathon, he'll watch all day. Ty and I prefer cartoons. 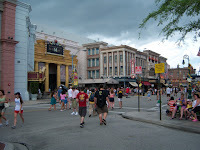 And we saw some come to life at Universal Studios. 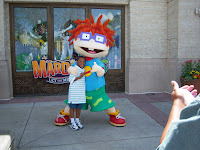 We ran into Chuckie from Rugrats right away, and just in time. 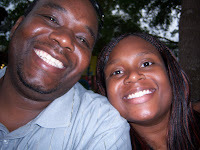 It had to be 85 degrees and humid that day and he went inside right after us. If I had been in a giant costume, surrounded by screaming kids, I would have been less than pleasant. We also saw Jimmy Neutron exploring a street with Dora. I don't think there was anything romantic about it though. He's all science and even though she's bilingual, I don't think she's smart enough. There were fewer rides and more attractions. We took the Jimmy Neutron Nicktoon Blast (I beat all the kids at the Jimmy Neutron / Spongebob trivia), and sat through the Shrek 4D story. I also found out that there is an attraction based on Twister, the movie. Not only does it exist, but it's intense. Ty was against it, and bored by the Bill Paxton / Jodie Foster vignettes during the wait. But after the flying cows, fire, wind and rain, he was a fan. Although he still doesn't think tornadoes are real. We'll have to work on that. We rode an indoor roller coaster based on The Mummy, survived a Jaws shark attack, and shot aliens after going through the Men In Black training. 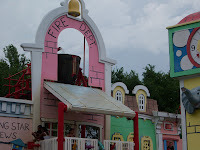 And then we arrived at the best kids' attraction I've ever seen: The Curious George Goes To Town Interactive Playground. I think that happened on either side every five minutes. And there was an adoring crowd every five minutes. Ty ran amok, and my dad and I just watched. My dad rang him out as much as he could, but the sun was setting and it was time to go anyway. We didn't do anything the following day, which is how I like my vacations. The day after that, I flew back to Las Vegas for all the adventures waiting there.